I absolutely love peaches. Eat them fresh, eat them frozen, sprinkled with cinnamon, it's all good to me. 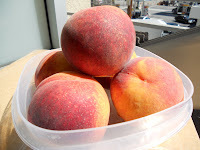 So, when my grocery store was selling peaches for less than 50 cents a pound, well, I couldn't resist. I went and bought 12 pounds of peaches. No, I wasn't buying them for anyone else to eat, there's only me. No, I wasn't crazy. It's just that I love a good deal and I do eat a lot of fruit. Still, that was an awful lot of peaches. What could I do with them all? 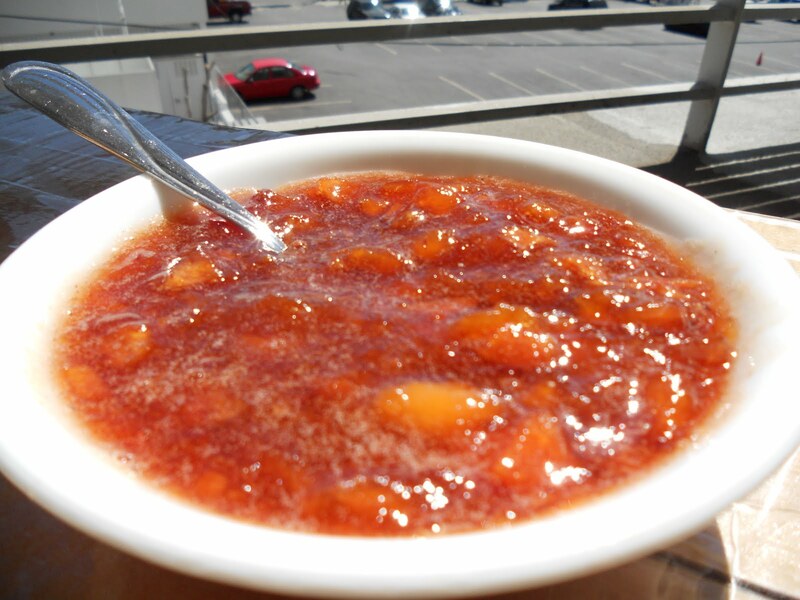 How about making some Peach Jam? Sound like a good idea? It did to me. Now, I had never made jam before in my life, but there's a first time for everything. The recipe that I found didn't require a lot of ingredients, but it is a bit time consuming. First you need to skin the peaches by blanching them in hot water and shocking them in cold water. Then, the skins are "supposed to" come right off. Well, mine came half off and the other half stuck stubbornly on the fruit. In hindsight, I guess my water may not have been hot enough, or I didn't blanch them long enough. Either way, I ended up just skinning the rest off with a knife. Then, I cut up my peaches, added a little lemon juice, and set them to cook on the stove. It took a little longer than the recipe stated for my peaches to break down, but soon I was adding my sugar and waiting for it to gel. Ten minutes later, and I had this beautiful bowl of jam to show for all my hard work. Yum. It's like a bowl of golden sunshine. I added a little cinnamon to mine to give it a little kick. Now, what should I do with all this sweetness? Maybe eat it on toast. Yeah, that sounds good. I think that's what I'll do. The last of summer never tasted so good. Place a small plate in the refrigerator to have chilled for testing the set of the jam. Place the peaches and lemon juice in a 3 qt. heavy-bottom sauce pan. Over medium-low heat, let the peaches cook for about 15 min. to become very soft and release their juices. Stir frequently to prevent burning and lower the heat if necessary. As the peaches soften, mash them with the back of a spoon. Once the peaches have broken down and cooked for 15 min., reduce the heat and stir in the sugar. After the sugar is completely dissolved, increase the heat to medium-high and bring the jam to a boil for 5 min. Place a small dollop of jam on the chilled plate and put it in the refrigerator for a minute or two. To check for setting, push one edge of the jam toward the center of the dollop. If the surface wrinkles, the jam is set and can be removed from the heat. If not, continue to cook and re-test every few minutes. Transfer the jam to a clean jar and store in the refrigerator. Enjoy within 1-2 weeks. I'm so excited. This will be the first online baking group I've ever joined. In case you haven't heard about it, it is being hosted by April of Abby Sweets. The way it works is that every person in the group gets to choose a cookie recipe to make and post each Friday. 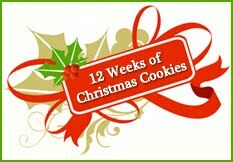 This continues for 12 weeks starting on October 1 and ending on December 17. Anyone can join - just send April an e-mail and she'll add you to the fun. I can't wait. I've got my to-do list of cookies all ready to go (well, almost). Butter Mochi . . . Cake??? 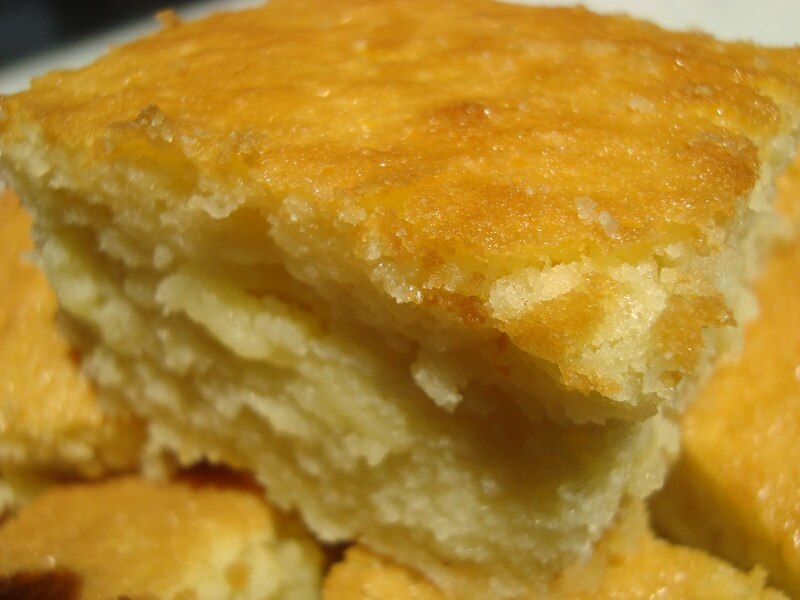 No, that's not cornbread you're seeing, nor is it a plain Jane yellow cake. This is something much, much better. It's Butter Mochi Cake (and I do emphasize the "butter" part). My sister could absolutely live off of butter mochi. It is her all-time favorite. In fact, when we were at the store, she was actually willing to pay more than $5 for a few small pieces of it. That to me was unthinkable. So, I convinced her to put that measly tray back by promising her that I would make an entire panful of the stuff just for her (much cheaper that way). Of course, I had never made butter mochi before in my life, so I guess it was sort of a risky promise. But, I had faith in my baking skills and was sure I could find a good recipe, so we bought the ingredients and I put myself to the test. First off, finding a decent recipe. If I could do that, the actual making of it would take care of itself. I went straight to a book called "Hawaii's Best Mochi Recipes" by Jean Watanabe Hee. 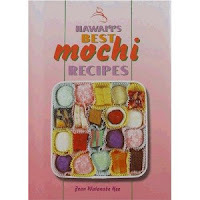 This is a wonderful little book with all sorts of recipes for mochi - blueberry mochi, pumpkin mochi, strawberry mochi, and more. I bet you didn't know there could be so many variations for that chewy little treat. Upon looking, I found not one, but three recipes for Butter Mochi. Each one differed regarding the ingredients and the amounts used. How was I going to choose? Well, I did the only thing I could do, I crossed my fingers, hoped for the best, and picked one. 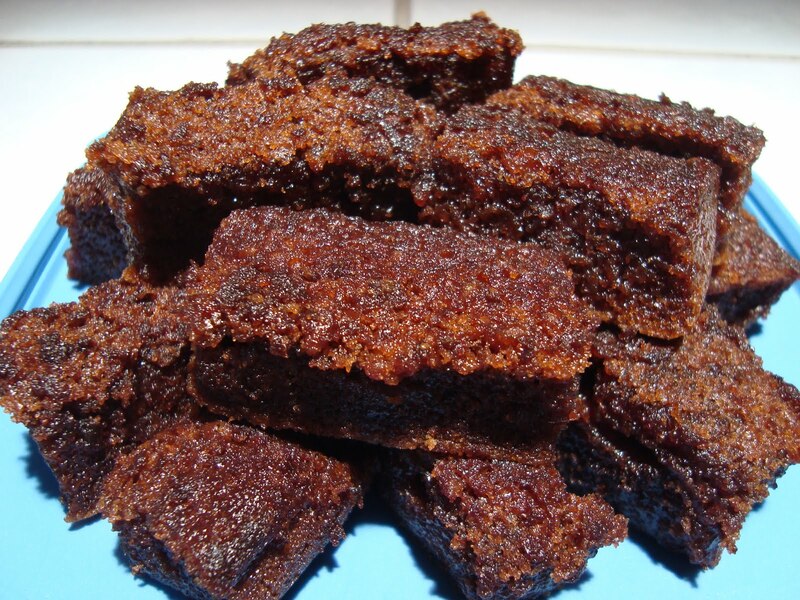 The ingredients used are very rich - one WHOLE stick of butter (no substitutes), 2 1/2 cups of sugar, and a whole can of coconut milk (I used the good stuff, not the lite - after all you only live once). After combining the ingredients, you pour everything into a well greased pan (mochi is very sticky). Then, you pop it into the oven and let it bake. The smell from the oven was heavenly - imagine the air wafting with butter and a slight coconutty undertone. Once it was done baking, I pulled it out and stared in awe at its beautiful, luscious, shiny, golden surface. It's 24 Karat goodness alright. The only thing we noticed was that it differed in texture from other butter mochi we had eaten before. Butter mochi is usually very dense, but this one was, dare I say, fluffy, like a cake??? But, upon tasting it, all was forgotten. The taste was perfect, spot-on. It was buttery and sweet, like eating warm sunshine itself. My dad even said that he liked it better as a cake. As for my sister, she was happy as a clam. I don't think she'll ever buy butter mochi again. Melt butter and set aside to cool. Combine butter with sugar. Add the eggs and vanilla. Add the coconut milk. Combine the baking powder with the mochiko flour and add. Mix with spoon until batter is smooth. Pour into well-greased 9x13 pan. Bake at 375F for 1 hour or until toothpick comes out clean. Cool and cut into squares. Being from Hawaii, I grew up eating mochi. But, I had never eaten Cocoa Mochi until now. Seriously, "Cocoa Mochi, where have you been all my life?" My mom had a recipe for it, but she herself had never made it. My family, however, was eager to try it, and, since I was on vacation and had a lot of time to bake, I was elected to break this recipe in. The recipe was extremely easy to follow. The only thing I noticed is that the mochiko flour tends to clump a lot when you add it to the wet ingredients. Obviously, you can't bake it like this because the lumps will turn hard in the oven and it just won't be very good. I solved this problem by pressing the batter through a strainer. It was quick work and the batter became smooth as silk. After baking them, we took a taste. They were chewy, chocolatey, and ever so good. Think of brownies, but in a mochi form. My family absolutely loved them and promptly began to devour the batch. My sister took them to work with her and her co-workers loved them. I made another batch that same night and my mom took it to work with her. She said that her co-workers wiped them out. 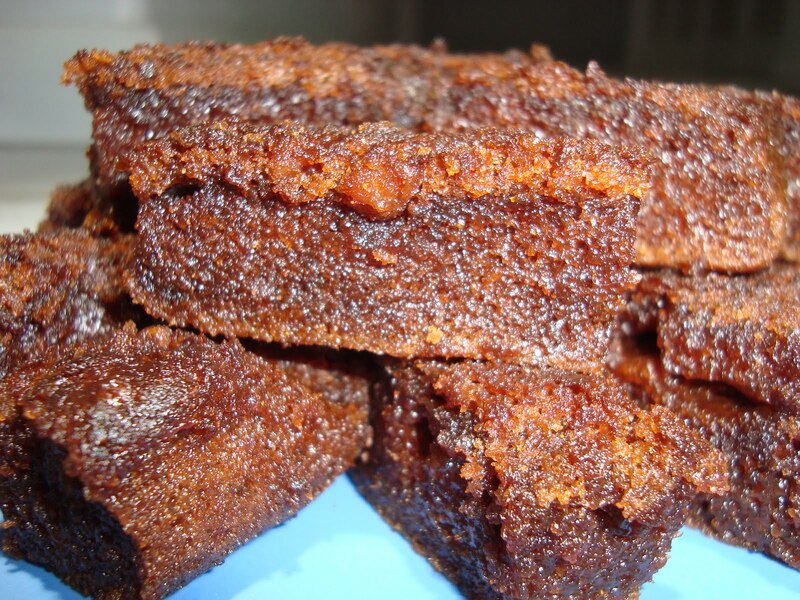 So, the next time you have a chocolate craving, you could turn to the old stand-bys like cake or brownies. But, seriously, with a recipe like this, why would you? Kick things up a notch and satisfy that craving with Cocoa Mochi. Combine the butter with the sugar. Add the eggs and cocoa powder. Add the coconut milk. Add the evaporated milk. Combine the baking soda with the mochiko flour and add to the wet ingredients. 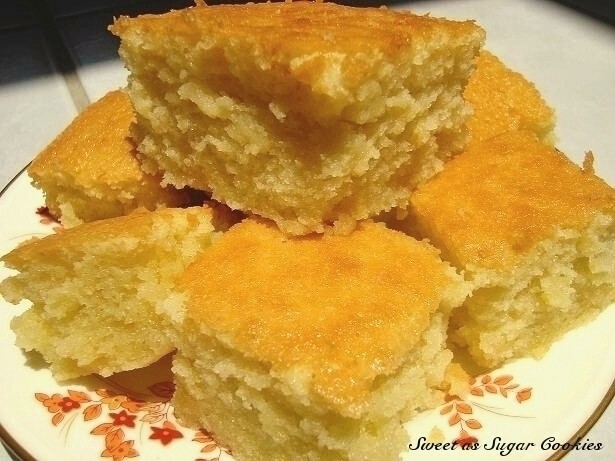 Upon adding the dry ingredients and stirring, you will find that the batter is very lumpy. Push the batter through a strainer to remove all the lumps. Pour into a greased 9x13 pan (or even better, a pan lined with parchment paper) and bake at 350F for 1 hour. I have always wanted to try making a lemon meringue pie, not because it's my favorite, but because it seems like such an accomplishment to be able to make one. 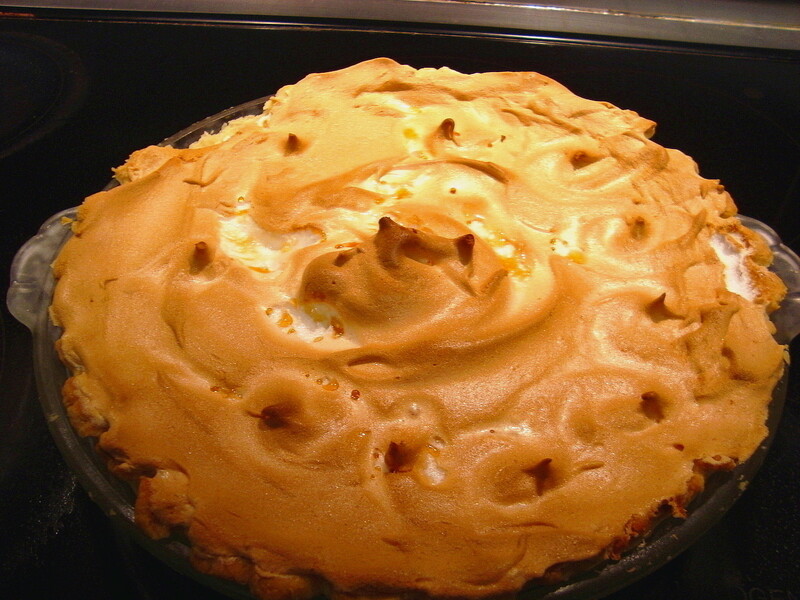 After all, there are so many problems inherent in the process - the meringue weeps, the meringue shrinks, the filling is runny, the pie crust burns or is not flaky enough, etc., etc. To tell the truth, the very idea of trying to make one intimidated me. Until I found a recipe on Anna's Cookie Madness website. It was called Fool-proof Lemon Meringue Pie. Well, with a name like that, my worries were over. I absolutely love Cookie Madness. She makes the most wonderful recipes and always gives insightful notes and tips that are a big help. She even makes multiple recipes for the same treat and then reviews them all at once so you know exactly which one will suit your purposes and likes. 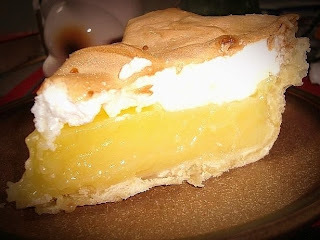 After reading her review on this recipe, I decided to follow it exactly as written with the exception of using her Betty Crocker recipe for the meringue, since she said that it doesn't weep like some others. With the perfect recipe chosen, I set myself to the task. I will admit that it's not a quick process since there are so many steps - making the pie crust, blind baking it, making the filling, and whipping the meringue. But, it is easy to follow. As Anna directed, I made the meringue before making the filling. As you know, meringue takes quite a while to make. Furthermore, the meringue needs to be put immediately onto the filling while the filling is still hot, so as to prevent weeping later on. At one point, I was worried that the filling wouldn't set since it seemed very liquidy. But, never fear, as soon as it started to bubble, the filling thickened all at once forming a potful of beautiful, translucent, lemony goodness. I then poured the hot filling all at once into my pre-baked crust, slapped on my pre-made meringue, and popped it in the oven. The meringue turned a lovely shade of light brown and then my pie was done. I was so pleased. The meringue was still spread nicely over the pie - no shrinking. In addition, it hardly wept at all. But, how did it taste, you ask? Delicious. The filling was set and sliced perfectly. The meringue was fluffy and the pie crust was flaky. My family was thrilled. Even I couldn't stop nibbling at it, which really says something since I've never liked lemon meringue pie before in my life. After this, though, this will definitely be my go-to recipe. It's not just fool-proof, it's a success. Beat egg whites and cream of tartar with electric mixer on high speed until foamy. Beat in sugar, 1 Tbsp. at a time. Continue beating until stiff and glossy. Do not underbeat. Beat in vanilla. Combine the sugar, cornstarch, and salt in a saucepan. Whisk in 1/2 c. cold water, lemon zest, and lemon juice, blending thoroughly. Whisk in the egg yolks. Add the butter and whisk in 1 1/2 c. boiling water. Set pan over medium high heat and stir until mixture boils, about 7 minutes. Reduce heat to medium and stir filling 1 minute more. Pour hot filling into pie crust and top with meringue. Spread meringue to seal it to the edges of the crust to prevent shrinking. Bake at 350F for 15-20 min. until meringue is light brown. Cool pie for 2 hours. Chill the cooled pie in the refrigerator. I recently found out that my sister prefers bars as opposed to cookies. So, I decided to make these for her. The recipe, as found on Dozen Flours, is quite interesting. You start off by making a sort of caramel with butter and brown sugar. It will be on the grainy side and will become a little stiffer as it reaches the right point. I can only imagine how delicious this alone would be crumbled on top of vanilla ice cream. But, I digress. You then add the rest of the ingredients, stir in a whole bag of chocolate chips, and bake. Then, after baking, you top the bars with another cup of chocolate chips because you can never have too much chocolate, right? Right. The result is definitely swoon-worthy. 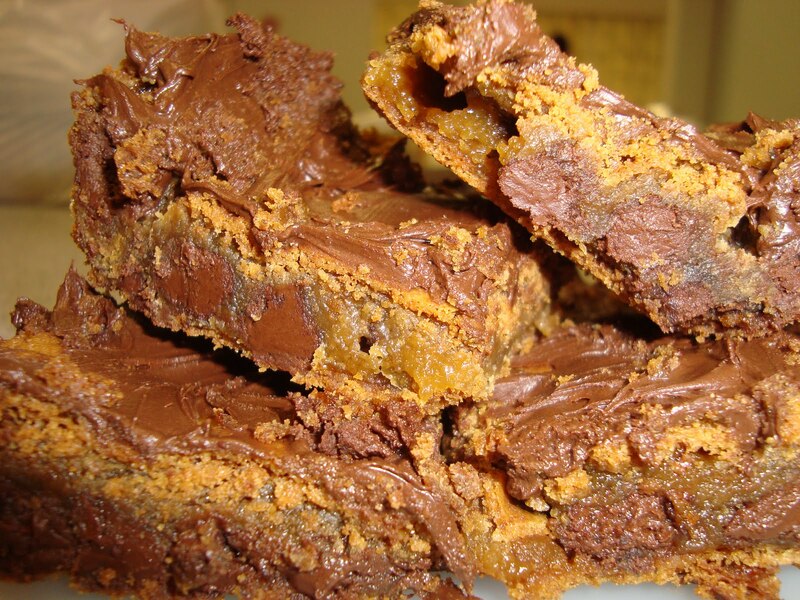 They are rich, chocolatey, gooey, and slightly caramelly. Dozen Flours described it as a cookie crust with a layer of brownie, followed by another layer of cookie crust. I have no idea how the batter separates itself that way, but it works for me. I can only imagine how these would be if I swapped peanut butter chips for the chocolate chips on top. Oh, the possibilities. Of course, the ultimate critics were my family. And the verdict was . . . they absolutely loved these bars. My sister even requested that I leave her the recipe so she can make them again. So, there you have it. This recipe gets four thumbs up. In my book, that's a keeper. Preheat oven to 350F. Grease 9x13 pan and set aside. In a medium sized saucepan, over medium heat, combine the brown sugar and butter together, stirring constantly until the mixture becomes very thick and starts to bubble. Once it starts to bubble, continue stirring constantly, scraping the sides and bottom of the pan for an additional three minutes. Do not increase the heat. (Note: you're not looking for a caramel here, but you want the mixture to almost be to the point where the sugar is dissolved, but not quite). Remove the pan from the heat and continue to mix by hand for about 1 minute. Pour the hot mixture into a metal stand mixer bowl and mix on low speed for 3 min. Increase the speed to medium and mix for two minutes, stopping once a minute to scrape down the sides and bottom of the bowl. By now the mixture should still be warm, but not molten. Return the speed back to medium and slowly add the eggs and vanilla. Add a little at a time to avoid the egg scrambling. The batter should get very shiny and turn a pretty shade of light brown. Continue mixing until all the egg is incorporated. Be sure to scrape down the bottom and sides of the bowl. Add the flour, baking soda, and baking powder. Add the milk chocolate chips and stir to combine. Pour into the baking pan and bake 25-30 min., until a toothpick comes out clean. Remove it from the oven and scatter a cup of semi-sweet chocolate chips on top. You may need to add more chocolate chips to fill in any bald areas. Let cool completely and cut into bars.